Discriminated Against? Become a Plaintiff! Or submit an affidavit! This text is subject to change without notice, as developments require. We, the undersigned, are long-term non-Japanese residents and/or naturalized citizens of Japan, who contribute to this society like any other citizen of Japan but are not accorded equal treatment. We have received separate and unequal treatment on the basis of our physical appearance, national origin, or ethnicity. Yet Japan's government has not given us protection against racial discrimination, guaranteed to all people in Japan by both the Japanese Constitution and by the United Nations Convention on the Elimination of Racial Discrimination (CERD), which Japan effected in 1995. Japan must improve its legal and social treatment of people it regards as foreigners. Discrimination on the basis of race or physical appearance affects not only foreign residents, but also Japanese citizens who "look foreign" (such as naturalized citizens and international children). Despite Japan's internationalization, including record numbers of immigrants and international marriages, even today racial discrimination is not illegal in Japan. This irresponsible lack of laws and protections hinders Japan's inevitable development as a more multicultural society, which it needs given its low birth rate, aging society, and dwindling taxation base and domestic industrial workforce. We, the undersigned, each represent a related instance of discrimination unchecked by any Japanese laws. We are rallying public support for establishing legislation against racial discrimination, and for ameliorating racism in Japanese society. WHY ARE WE FILING A LAWSUIT? Over many years, we, in conjunction with many other members of Japanese society, have tried every other domestic avenue--administrative, legislative, and judicial, and at all levels of government--to redress and stop specific abuses of racial discrimination. Although our efforts have not gone ignored, the fact is that overt racial discrimination in Japan, evident in the increase in the number of businesses overtly displaying "No Foreigners Allowed" signs, is getting worse. In one specific case, described in the book "JAPANESE ONLY--The Otaru Hot Springs Case and Racial Discrimination in Japan" (Akashi Shoten Inc. 2004, ISBN 4-7503-2005-6), nothing could force a public bathhouse named Yunohana in Otaru city to remove its exclusionary signs, and open its facilities to all customers regardless of race or nationality; nothing, that is, except a lawsuit. Subsequently, after four years of unsatisfactory judgments in the Sapporo District and High Courts, in April 2005 Japan's Supreme Court refused to consider this lawsuit. The Supreme Court let stand their rulings that a defendant, the City Government of Otaru, was in fact not bound to follow the UN CERD treaty. Thus a local government need not take any responsibility for racial discrimination within its jurisdiction. This is not only a violation of the CERD, it is also unconstitutional. When Japan signed the UN CERD treaty (which is regarded as "superior to domestic law"), it bindingly promised to "take all measures (including legislation) without delay to bring racial discrimination to an end." This lawsuit prompts the national government to keep its promises. When Otaru City disclaimed any responsibility in court, it argued that as a local government, it technically never signed the CERD. This is not an argument the national government can make, of course, which is one reason by we are taking them to court this time. Another reason for this lawsuit is recent legal precedent. On September 14, 2005, the Supreme Court ruled, in a landmark case concerning overseas voting rights for Japanese citizens, that the lack of a law upholding guaranteed constitutional rights is now considered be legally-actionable negligence by the legislative branch. 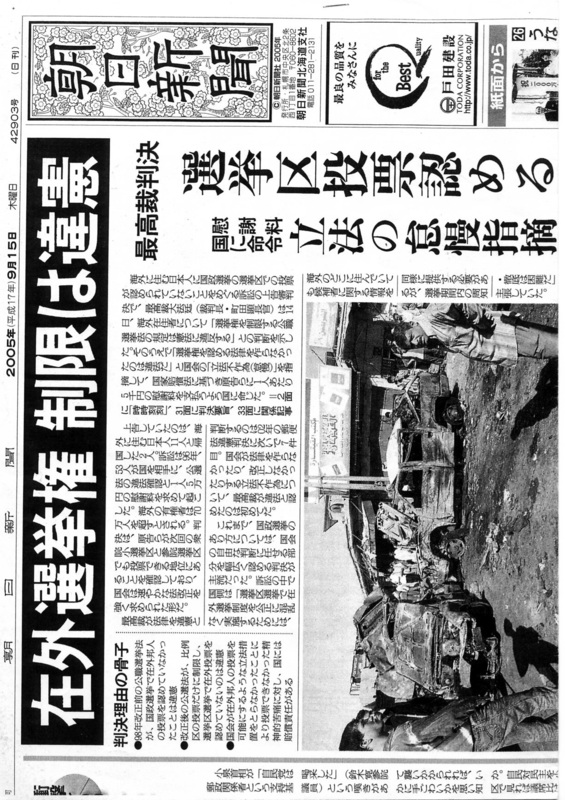 (See this also in Japanese, Asahi Shinbun, Sept 15, 2005, top story). Only a year beforehand, in the Otaru Case, the High Court had ruled that the lack of a law (i.e. against racial discrimination) was not legally actionable, as it would constitute a violation of the separation of powers (i.e. the judicial branch forcing the legislative branch to pass laws). This new ruling now establishes the legal basis of this suit. WHAT IS OUR EVIDENCE OF RACIAL DISCRIMINATION IN JAPAN? Each plaintiff cites specific discrimination by race or national origin which he or she has suffered in Japan. As of October 2005 we have divided this lawsuit into two "waves", with half of our plaintiffs filing suit at different times depending on the complexity of their case. THE LAWSUIT'S "FIRST WAVE" is one of simple exclusions—by bars, restaurants, realtors, public facilities, etc. We need these cases to be as "simple" (meaning uncomplicated by labor disputes, contracts, divorces, other complicating factors that would enable a judge to wriggle out of ruling on the racial discrimination of the case, i.e. "it's not a issue of racism, it's just a hiring practice, which is at the employer's discretion" etc.). Best thing is getting refused at a place with a sign up saying "JAPANESE ONLY" etc., where it is clear that the only reason for the discrimination is because the person looks non-Japanese. 1. ARUDOU Debito, of Sapporo, cites his years of being refused service as a "foreigner"--despite having Japanese nationality--at many different types of private-sector businesses nationwide open to the public. 3. PLAINTIFF THREE wishes to remain anonymous from press reportage, but cites his experience of being refused entry into a private-sector business in 2004 due to his foreign appearance. Others are welcome to join, even remain anonymous if they prefer (their names will of course appear on court documents; the media will just enforce a moratorium on making your name public). Costs are negligible as well (about 30,000 yen for filing--that's all! ), so there is little to no downside. Or if you don't want to go even that far, you can submit an affidavit (anonymously if you prefer) stating what happened to you (ex. when and where you were refused an apartment to rent). Please consider it? The more people we have as plaintiffs representing a wide spectrum of discrimination, the more likely we'll be able to convince a judge to rule that something should be done about it by Japan's lawmakers. Others are welcome to join, even remain anonymous if they prefer (their names will of course appear on court documents; the media will just enforce a moratorium on making your name public). OTHERS WHO WISH TO JOIN THIS LAWSUIT AS PLAINTIFFS are encouraged to contact Arudou Debito at debito@debito.org . We will need your deposition outlining the facts of your case (i.e. a full description of the whos, whats, wheres, and whys). If it's a straightforward case of a refusal by a business offering service to the general public, then please join the First Wave, please. If it is a contract dispute or something more complicated, please join the Second Wave (filing date TBD). It would also help if you got a lawyer involved, so see how to here. If it's a labor issue, please consider joining a labor union (see how to here) to help represent you as well. Contact us first, anyway, and tell us your case. Information on legal and societal barriers to Japan's foreign residents, which we hope to help resolve through this lawsuit. Some people say Japanese don't sue. Quite wrong--millions of Japanese sue every year! See a Japan Times article on this, and discover what sort of people seek social justice in Japan. You'd be in quite good company! In sum, Japan is becoming an international society. However, if the present situation is not changed to make racial discrimination an illegal, punishable activity, many people, including Japanese citizens, will suffer. Though this lawsuit we hope to raise awareness of the issues, and bring about positive change to make Japanese society a better place to live for all residents regardless of race, ethnicity, or national origin. This text is not finalized, and is subject to change without notice.